AV Illustrations - Alexia Varnava - Full of cute illustrations, handmade craft and quirky gifts. Alexia created our logo. Check her out! Camping Argostoli - Located walking distance from the Lighthouse and beautiful beaches, Lefteris and Stephania will give you a warm welcome to their traditional campsite. Comic Book & Movie Reviews - Is exactly what it says on the tin! However for us so much more. David has supported Kefalonia Cruise by creating this website and making himself available to us whenever we need it, giving technical and practical advice which has made such a difference to us. Thank you. Crepa Land - Located in the square. Amazing freshly made crepes. Very yummy! Detta Darnell - This wonderful, multi talented woman paints, writes poems and offers women's retreats in Kefalonia. She will fill you up with encouragement, motivation and inspiration to go back out into the real world and fulfill whatever it is you desire to achieve. Down The Rabbit Hole - Visit this stunning jewellery shop located on Kabana Square, off the Livostratho. Once you enter the door of this quirky, unique shop, you'll think you've fallen down the rabbit hole! Gilly's Place Kefalonia - Gilly's Place is privately owned and managed, a real home, not just a holiday home and it is quite simply paradise. Conveniently situated only 12 minutes from the airport and 15 minutes from Argostoli with it's excellent shopping, restuarants and vibrant harbour-side, the house nestles on the hill at the edge of the village of Lakithra. 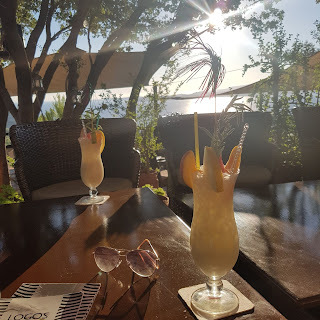 Kefalonia By Anna - Anna has created this site to give you a wealth of reasons to visit the beautiful island of Kefalonia! You will find her favourite accommodations and attractions. She even proposes a 7/14 day itinerary. Kefalonia Massage - Christina offers a variety of massages including Hot Stone massage, deep tissue massage or why not try a luxurious pedicure? You will not be disappointed. Kefalonia New Homes - Thinking of building a home in Kefalonia? They specialize in the construction of high quality residential and commercial properties. Founded in 1988, they really know their stuff. Ladokolla - Ladokolla is a restuarant with something missing. Plates! Most of the dishes are served on grease proof paper making the experience unforgettable!! 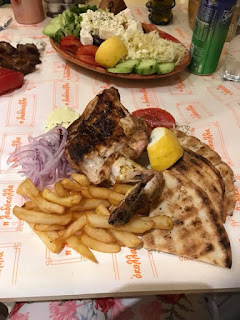 Ladokolla is easy to find on the square. Give it a go! Outdoor Kefalonia - If you are adventurous and fancy exploring Kefalonia in a different way, George from Outdoor Kefalonia offers a range of activities. It's a must! Vassaliki Naturist Club - Sam and Mark welcome and offer something unique to their guests during their visit to the island of Kefalonia. Vassaliki Naturist Club is a premier naturist paradise, nestled amongst the splendour of traditional Greece. If you are unsure if it's your thing, why not go for a day visit and meet them. from Ammes Beach with some very good tavernas nearby.